What a veritable Disneyland for a photographer THAT scene is. I'm going to have to add Beantown to the itinerary next time I get back east. Your shots are always so interesting and so thoughtfully done. That visual noise in the reflection is what I feel in my gut when I drive into Boston. The balance of that shimmer with the solid buildings and the pedestrians is really perfect. Fantastic reflections!Beautiful capture as always! Such a full photograph, yes you're right there are many shapes and reflections offset perfectly by B&W. i love it. my inner ear, vertigo self doesn't love it, but I love it. 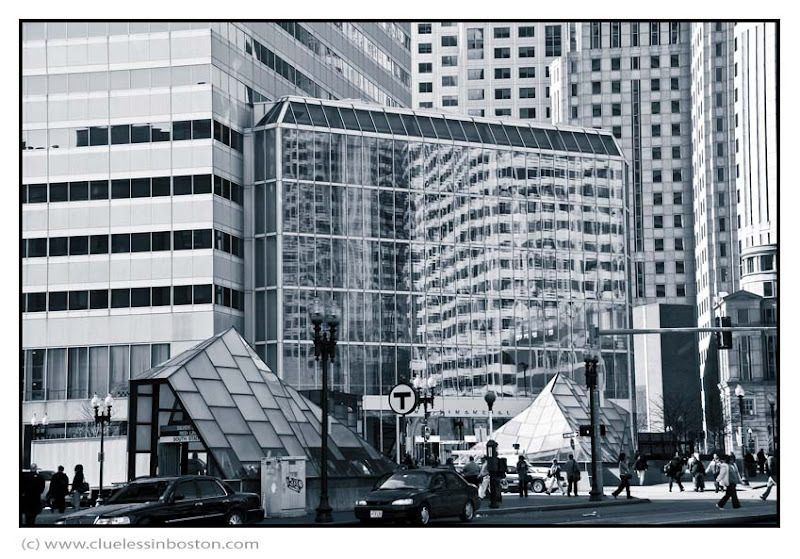 Is this photo showing the Prudential T stop? Interesting to see these buildings in b&w. Nice shot. Is a fantastic image and I have almost a vertigo...incredible shot! That's a fantastic conglomeration of lines and angles! Nicely composed photograph. All those reflections make my head turn! Thanks so much for coming by Cedar Creek DP today! It almost looks as if you can see through one building to a distorted view of the one behind. Interesting shot. Welcome to MM and thanks for participating. Reminds me of a movie! It is surreal in a way. Nice shot and perfect in B/W! Harriet, this shot was taken on Summer Street, across the street from South Station; this area is also known as Dewey Square. Thanks for reminding me to note its location.